The latest inflation data saw prices soaring during February 2017, jumping on the governments preferred economic propaganda measure of CPI from 1.8% to 2.3% (0.6% pre-brexit), a 0.5% jump in one month that annualises to a 6% momentum rate. Whilst the more widely recognised RPI inflation rate busted above 3% from 2.6% to 3.2% (1.4% pre-brexit) and real demand adjusted inflation broke above 4% to 4.4% (1.9% pre-brexit). Whilst factory gate price inflation also rose to 3.7%, signally higher future official inflation. In terms of inflation expect UK CPI to spike above 3% and then remaining in the 2-3% range well into 2018. Current wage growth is estimated at 2.1% down from 2.3% for January so now official inflation at 2.3% exceeds worker earnings implying that workers on average are now basically just standing still. However in reality actual inflation is far higher with RPI at 3.2% and real demand adjusted inflation at 4.4% implying that the UK economy has entered a period of stagflation, one of the real terms erosion of the purchasing power of earnings, i.e. falling demand which increases the risks of a recession as the economy enters a depressed stagnant state where workers are not able to maintain consumption of goods and services resulting in economic depression with inflation i.e. stagflation. Normally one would expect the Bank of England to respond to soaring inflation by hiking interest rates. Unfortunately we have not been living in normal times since 2008. Therefore it is highly probable the Bank of England will do nothing instead decide to ride out the inflation spike hoping that it turns out to be temporary, especially if the economy starts to stall. Once such example of the game all major producers / super markets are playing is one of shrinking package contents. 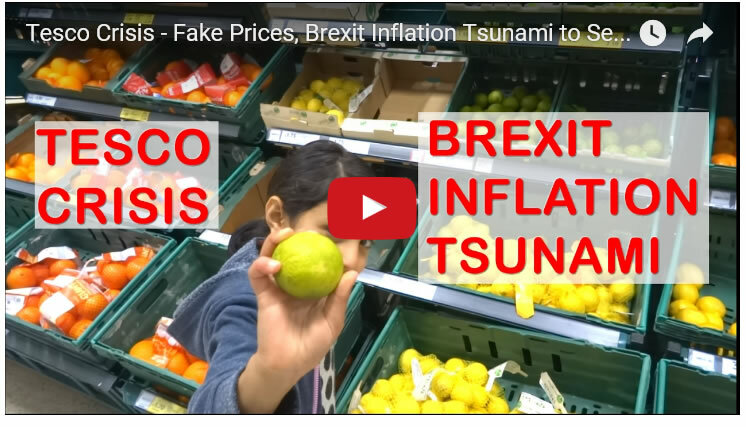 A 10% to 15% cut in pack contents achieves far more inflation than from sterling's drop which on average would equate to about 5% of the price of goods in the shops. 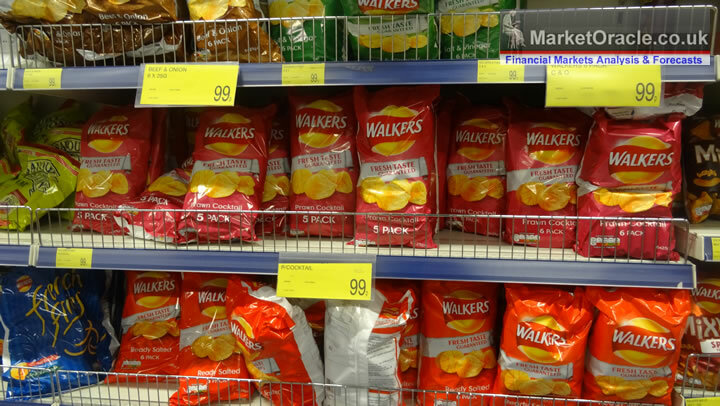 For a real world example of shrinkflation have a look at this photo of a super market shelf selling walkers crisps multi-packs for 99p, do you notice anything strange ? Here's a closer look, now do you see ? 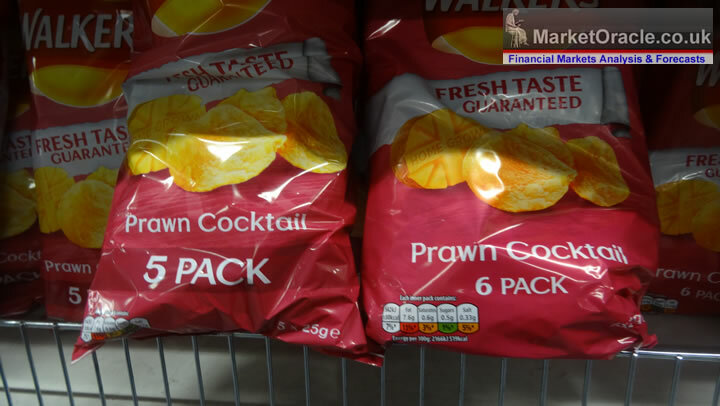 Yes that's right, crisps multi packs that had been sold in packs of 6 are now suddenly being sold in packs of 5 at the SAME price! An effective stealth inflation price hike of 17% on the item without impacting the inflation indices! In fact for ultimate consumer confusion the 5 and 6 packs are even being mixed together to better fool consumers into buying. 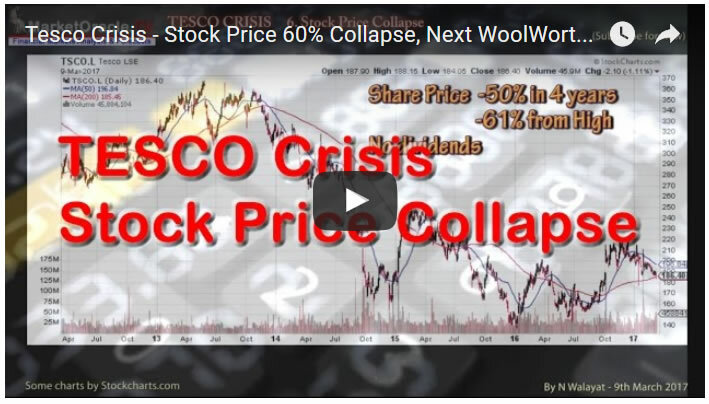 Tesco Crisis - Stock Price 60% Collapse, Next WoolWorth's? As an example of the pain the retail sector is suffering, Tesco by far ranks as Britain's number 1 retailer in terms of sales of over £54 billion for the last accounting year, more than twice its nearest rival Sainsbury. The Tesco stock price says it all of just how badly run Britain's super market giant has been for many years, which goes beyond the usual dynamics of a badly run businesses that over expanded during the good years. For you know when a companies in deep trouble when the Serious Fraud Office has been investigating it for several years. And whilst the fraud is estimated at £326 million, however when it's all done and dusted the verdict could be accompanies by an even bigger shock to Tesco's finances, a mega-fine of upwards of £500 million. At £1.87 the Tesco share price is trading at LESS than 50% of its 2013 high. That's a 50% LOSS of stock market value over the past 4 years, valuing the super market giant today at just £15bn. I am sure many inexperienced investors looking at the 50% collapse in the Tesco share price might be imagining how cheap Tesco is right now, find out what the prospects are for Tesco's stock price in my latest video. 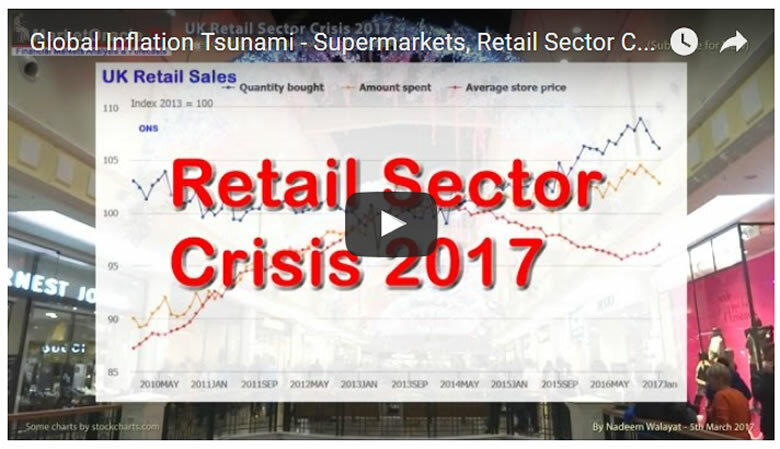 More on the crisis the retail sector faces during 2017. 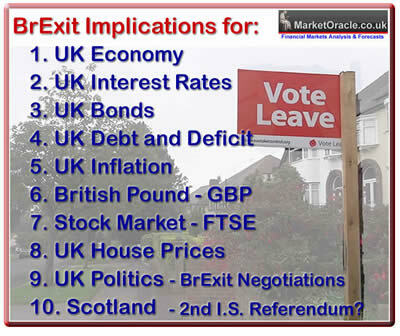 Ensure you are subscribed to my youtube channel for new videos as Britain counts down to BrExit.